We're just over three months into UMF’s experiment comparing chemical and organic treatments for coffee leaf rust. The experiment is going well, but full details on how the treatments are working will come later, as we are still analyzing the most recent sampling. Apart from the treatment results, we have observed something interesting and unexpected. We first saw it a little over a month ago, and we confirmed it with formal sampling this past week: branches that don’t have any leaves start to die, but branches with even one leaf remaining, stay alive. In our analysis, we found that 91% of branches that have no leaves showed signs of dying (dieback): blackened ends and softening of the branch. However, only 16% of branches with a single leaf showed signs of dieback. And 0% of branches that had two or more leaves showed signs of dieback. These results are interesting for two reasons. First, it suggests that keeping a single leaf on a branch will prevent most long-term damage that will affect future harvests. Having two leaves on a branch ensures that no long-term damage will occur to the branch. For farmers dealing with leaf rust, this observation has important potential implications. Throughout the course of the harvest year, a coffee plant grows new leaves, although this growth is concentrated during the rainy season. Farmers may be able to prevent long-term damage to a plant simply by using proper preventative measures to protect new leaves, even when older leaves of a plant are highly infected by leaf rust. Second, our observation suggests that the long-term effects of leaf rust are branch-based, rather than plant-based. If a branch losing all of its leaves had a negative effect on the rest of the plant, we would expect to see a larger number of branches that show dieback but still have leaves. This means that proper treatment of leaf rust on one branch will not necessarily prevent long-term damage to other branches on that same tree. But, conversely, damage to one branch will not necessarily cause damage to another branch. Furthermore, it appears that the effects of leaf rust are not transferred between primary branches and the secondary branches that grow off of them. Even though they are part of the same branch, we are seeing that secondary branches can lose all of their leaves and start to die while the primary branch continues to be healthy, and vice versa. These numbers are not yet conclusive, and further experiments will need to be run in the future to be certain that leaf loss is causing, not just associated, with the dying of branches. There is still much to be done in terms of understanding how to take these new results and convert them into practical leaf rust prevention advice to farmers. 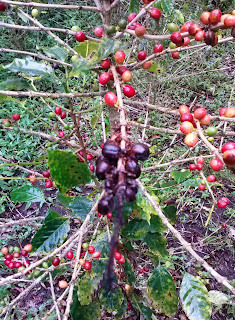 However, they are certainly suggestive that the last few leaves are vital to the survival of coffee plants. We will continue to keep you informed as the experiment progresses.